Are you at risk of being trapped in an uncompetitive business? Chances are the strategies that worked well for you even a few years ago no longer deliver the results you need. Dramatic changes in business have unearthed a major gap between traditional approaches to strategy and the way the real world works now. In short, strategy is stuck. Most leaders are using frameworks that were designed for a different era of business and based on a single dominant idea--that the purpose of strategy is to achieve a sustainable competitive advantage. Once the premise on which all strategies were built, this idea is increasingly irrelevant. Now, Columbia Business School professor and globally recognized strategy expert Rita Gunther McGrath argues that it's time to go beyond the very concept of sustainable competitive advantage. Instead, organizations need to forge a new path to winning: capturing opportunities fast, exploiting them decisively, and moving on even before they are exhausted. She shows how to do this with a new set of practices based on the notion of transient competitive advantage. 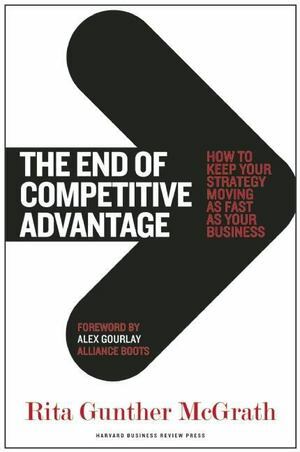 This book serves as a new playbook for strategy, one based on updated assumptions about how the world works, and shows how some of the world's most successful companies use this method to compete and win today. Filled with compelling examples from "growth outlier" firms such as Fujifilm, Cognizant Technology Solutions, Infosys, Yahoo! Japan, and Atmos Energy, The End of Competitive Advantage is your guide to renewed success and profitable growth in an economy increasingly defined by transient advantage.